Yesterday Android 6.0 Marshmallow for ASUS ZenFone 2 has arrived, for you who want to root your device you can use this method (Systemless Root). Gaining root access on Android devices isn’t a new concept, but the way it is done has changed with Android 6.0 Marshmallow. The new “systemless” root method can be a bit confusing at first, so we’re here to help make sense of it all, why you’d want it, and why this method is the best way to root an Android phone moving forward. Since Android 4.3, the “su” daemon—the process that handles requests for root access—has to run at startup, and it has to do so with enough permissions to effectively perform the tasks requested of it. This was traditionally accomplished by modifying files found on Android’s /system partition. But in the early days of Lollipop, there was no way to launch the su daemon at boot, so a modified boot image was used—this was effectively the introduction of the “systemless” root, named such because it doesn’t modify any files in the /system partition. Will appear on the screen to unlock the success of mobile phones after five seconds will reboot, then hold volume up the phone automatically re-boot back to bootloader. If you missed the previous step, press the power button for 10 seconds off, then press the "Volume Up" and hold the power button to boot into bootloader. After the phone has successfully re-enter the bootloader, click restore.bat on the computer, where the restore refers to the restore Android ifwi 6.0 otherwise Android phone can not enter the system. The phone will reboot and restore white on black ASUS logo screen, and then enter the Android system. 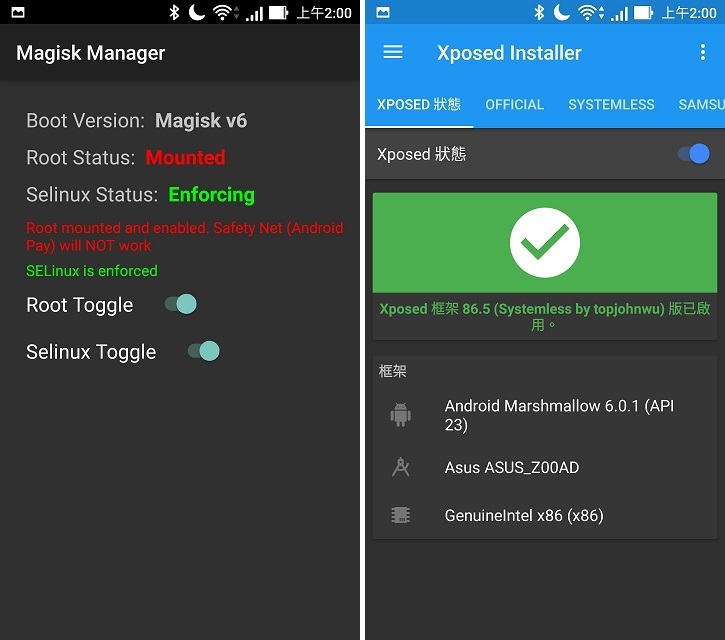 Magisk Manager: Root privileges can be used to switch the switching Selinux state. 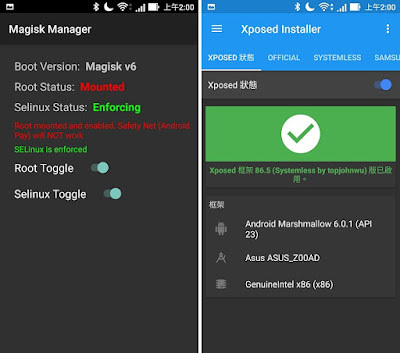 Xposed Installer: used to download / management Xposed module, switch Xposed state.